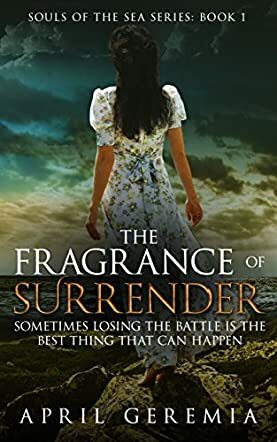 In The Fragrance of Surrender by April Geremia, Gabriella has trouble trying to start life over after the death of her husband, Nicolas. She takes her son, Sammy, and returns to the country and home of her childhood, far away from all the painful memories. High atop the cliffs overlooking the ocean, the scent of orange groves fill the salty air and the little yellow house waits to come to life again. What Gabriella has not considered in her escape from the present is that this place is filled with the painful memories of a young girl abandoned by the parents she loved. Now, confronted with the pain of the past and the present, she must find a way to survive it all. She blames God for a lifetime of loss and pain and she wants no part of Him. If not for Sammy, she would stand at the edge of the cliff and allow herself to slide down its steep banks into the welcoming ocean waters below. As Gabriella's eyes are opened to the truth of the past and the present, she struggles with a God who would allow such pain to exist, and finds herself presented with choices that only she can make. Choices that will affect this life and the one beyond. April Geremia presents a compelling story full of twists and turns that keep you wanting more. Her special talent for vivid and descriptive writing allows you to feel the fears and emotions of her well defined characters. Through Gabriella's journey of loss, grief, anger and ultimate understanding, April Geremia presents a message of hope in the midst of all of the chaos that life can bring. The characters are well done, the flow is smooth and steady, the message is clear, and this book was a pleasure to read. The emotions of her characters, the struggle to find the truth, and the fear of finally knowing it are all presented in a relatable and conceivable way. April's story is well written and The Fragrance of Surrender will impact all who read it. This is one of those books you will read more than once.